Rubabuddin Sheikh on Thursday approached the Bombay High Court challenging the Special CBI court's order acquitting all 22 accused in the killing of his brother Sohrabuddin Sheikh in an alleged fake..
▶ Videos for "Special Cbi"
A special CBI court in Panchkula on Thursday sentenced Dera Sacha Sauda chief Gurmeet Ram Rahim and three others to life imprisonment for the murder of journalist Ramchandra Chhatarpati more than 16..
A Special CBI Court convicted self-styled godman Gurmeet Ram Rahim in journalist Ram Chander Chhatarpati murder case. Quantum of punishment will be pronounced on January 17. 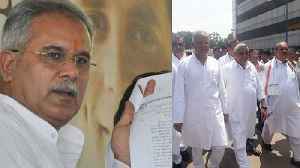 Ramchandra Chhatrapati, a..
Raipur: In a significant development in poll-bound Chhattisgarh, state Congress president Bhupesh Baghel has been remanded to judicial custody for 14 days by a special CBI court on Monday after the..
A special CBI court here Thursday rejected the interim bail plea of former media baron Peter Mukerjea, an accused in the Sheena Bora murder case. Special CBI Judge Arvind Kumar after directing the agency to file a response on the plea, slated the matter for April 9. Khaitan has sought bail for the second time contending that the investigation in..
Vadra is facing allegations of money laundering for the purchase of a London-based property at 12, Bryanston Square worth £1.9 million. Special CBI court on Tuesday posted the hearing in the anticipatory bail pleas of businessman Robert Vadra and his aide Manoj Arora for March 28, due to unavailability of Vadra's counsel. A Delhi court Monday allowed Congress leader Shashi Tharoor, accused in a case related to death of his wife Sunanda Pushkar, to travel to Saudi Arabia from February 28 to March 4 for attending a..
Special CBI judge Arvind Kumar directed the agency to supply within five days hard copies of the documents seized from Vadra during raids conducted at his offices in 2018. A driver working for a friend of Sanjeev Khanna told the special CBI court here Friday that he had dropped Khanna at a hotel in south Mumbai on the day Sheena Bora was killed. A special CBI court on Thursday awarded life imprisonment to jailed godman Gurmeet Ram Rahim Singh in the murder case of a journalist. The sentence will run consecutively, which means Ram Rahim will..
"My brother dedicated his entire life to this cause. He put everything on hold in his quest to get justice for my father," says Shreyasi Chhatrapati, daughter of slain journalist Ram Chander..
Special CBI judge in Panchkula, Jagdeep Singh, on Thursday, awarded life term to Dera Sacha Sauda chief Gurmeet Ram Rahim and three others for the 2002 murder of Sirsa-based journalist Ram Chander..
Special CBI judge Jagdeep Singh on Wednesday agreed to the Haryana government's plea to sentence controversial Dera Sacha Sauda chief Gurmeet Ram Rahim Singh and three others convicted for the 2002..
A special CBI court on January 11 convicted Dera Sachcha Sauda chief and three accomplices for criminal conspiracy and murder of Ram Chander Chhatrapati on October 24, 2002. On Thursday, Michel had moved an application before a special CBI court, seeking permission to make international calls to family, friends and his lawyers. Security in Sirsa, Panchkula and neighbouring regions were ramped up a day ahead of Special CBI court's verdict against Dera Sacha Sauda chief Gurmeet Ram Rahim Singh in the journalist murder case on.. In a fresh twist to the tussle within the Central Bureau of Investigation involving the agency's number 1 and number 2 officials, the investigative agency has divested Special CBI Director Rakesh.. The Special CBI Judge, Mumbai, who deals with CBI cases had acquitted all accused in Sohrabuddin case, the minister said, adding "more relevant than the Order of the Acquittal is the observation of the..
Special CBI Judge SJ Sharma made the remarks in a 350-pages judgement on 21 December, while acquitting all the 22 accused in the Sohrabuddin case. The court acquitted the accused due to insufficient..
A day after 22 accused in gangster Sohrabuddin Sheikh encounter case were acquitted by a special CBI court, Congress president Rahul Gandhi Saturday said "no one killed him" and he "just..
Congress President Rahul Gandhi took a veiled dig at the Modi government over judicial verdicts in the cases of alleged encounters and suspicious deaths Gandhi's remarks came a day after a Special CBI..
All 22 accused in the alleged fake encounter killings of gangster Sohrabuddin Shaikh, his wife Kausar Bi and his aide Tulsi Prajapati were acquitted Friday by a special CBI court because of..
A Special CBI court acquitted all 22 accused in the Sohrabuddin encounter case on Friday. Here is a list of the 22 persons acquitted by a special CBI court in the alleged fake encounter killings of Sohrabuddin Shaikh, his wife Kausar Bi and his aide Tulsi Prajapati. A special CBI court on Friday acquitted all 22 policemen who were in trial in the sensational Sohrabuddin Shaikh-Tulsiram Prajapati alleged fake encounter case of 2005. The policemen were acquitted due..
Special CBI Judge S J Sharma ruled the prosecution has failed to put forth any "documentary and substantive evidence" to suggest or establish the alleged conspiracy.